The Institute of Design (ID) at the Illinois Institute of Technology is building thought leadership and practice around using design to innovate for humanity’s most pressing, confounding issues. The world faces daunting global challenges—complex, fast-changing, and unpredictable problems—that design strategy is uniquely poised to address. Our students explore how the practice of design is evolving in response to large-scale economic, social, and technical changes. Our faculty teach methods and frameworks that support an emerging kind of design, one in which designers coordinate relationships between systems and foster conditions in which ecologies can grow. How might we design this experience to better reflect the current culture and values of IIT Institute of Design while affecting positive change in the city of Chicago? BarnRaise is a uniquely structured maker conference that connects design firms, community-based organizations, and participants from all fields to address a social topic embedded in the Chicago community. The event provides a dynamic view into how ID students are thinking about the broader role of design strategy and thinking in the world. Both designing for systems and participatory design are central to the ethos and vision of IIT Institute of Design. The institute also has made strategic choices about who may become a student, arguably resulting in a student body predisposed to design systemically. ID is the only all-graduate design school in the United States that accepts students without a background in design, attracting people who have seen the value of design thinking, strategy, and harnessing multiple perspectives in a variety contexts. ID has long valued human-centered design and the prior experiences and values of its students. Human-centered design (HCD), a term popularized by IDEO, is a method for creative problem solving that starts from a deep understanding of and empathy for users. Participatory design goes one step beyond HCD by designing with users instead of for them. It brings users to the table to help define the problems that need solving and allows them to collaborate with designers to develop effective solutions. Many ID students coming from outside of design bring an internalized understanding of the value that user expertise can have for driving impact. Both approaches draw on ethnographic methodologies and user expertise to generate insights that drive innovation and solutions anchored in what really matters to people. First, speakers orient participants to the role of design and recent innovations in the topic space. Everyone then breaks into multi-disciplinary teams. Under the facilitation of a design firm, each team works to understand and prototype human-centered solutions for a problem posed by one of the Chicago-based community partners. Moment, a design firm partner that facilitated a team at BarnRaise 2014 with community partner University of Pittsburg Medical Center, offers this comprehensive, inside account of the event, including details of how they balanced research, collaboration, ideation, evaluation, and building. BarnRaise was designed to facilitate knowledge sharing among designers and participants in other domains with the ultimate goal of creating a better, more innovative Chicago. In doing so, it is part of an international effort to spread design thinking. BarnRaise is based on the premise that enabling people to see how a limited set of design methods and frameworks can be successful in addressing a particular problem will generate more buy-in to design thinking, expanding the ecology of design in the city and more broadly. This in turn will better equip community leaders across the city to tackle complex problems. Of course, the networking that occurs at the conference also contributes to this change. BarnRaise promotes participatory design by involving community organizations as primary partners, enabling them to participate actively in designing solutions for their own challenges. Community partners have unique insight and knowledge to contribute towards solving for identified needs in Chicago. Rather than simply designing for the topic space generally (i.e., “What can we make to improve access to care in Chicago?”), the BarnRaise core team speaks to each community partner to determine a specific challenge that they are grappling with within the framework for action that they have created. Design firms then introduce methods and work with the community partner to leverage the creative thinking of the participants on their teams. 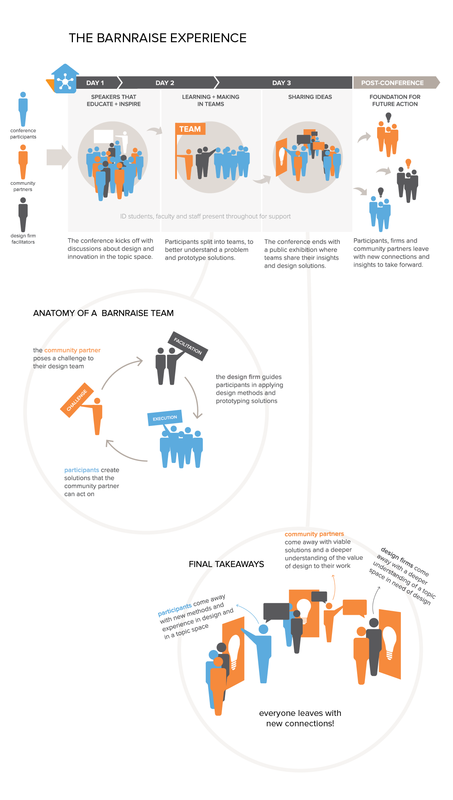 In this way, BarnRaise tries to respect, utilize, and share the expertise of community partners. Community partners also serve as a conduit to the diverse population of Chicago by connecting BarnRaise teams with real users on the ground. This brings more people into the design process and helps teams cultivate empathy for barriers and challenges. The hope is that the connections made with community partners and the access to their topical expertise will also be useful for design firms that do other work in the space. It's no secret that the healthcare industry is in great need of reform. It must become more cost-effective and efficient at the same time that it must provide better experiences for patients. Though this is a dauntingly complex system, it’s also one that lends itself to design. As the leaders of the Mayo Clinic Center for Innovation have noted, “tearing down everything and starting over is not an option in healthcare” (LaRusso, Spurrier, Farrugia, 2015, xv). Transforming the way people experience healthcare will have to be done incrementally through iteration and prototyping of new ideas, always with humans at the center. There is an existing foundation of collaboration between healthcare and design, as well as some great work in designing for complexity in healthcare and patient-centered participatory design. Prescribe Design is a great entry point for anyone looking to learn more about this work. The BarnRaise model of tackling discrete, contextualized challenges aligns with this framework. At BarnRaise 2015, all of the design challenges will be framed along a patient's access to care journey, including barriers to entry, the service experience, and sustained health. The BarnRaise core team is in the process of developing methods for tracking the impact of the conference both in terms of the spread and uptake of design thinking and the viability of the actual solutions prototyped at the conference. BarnRaise has expanded its strategic, community, and design firm partnerships for 2015 to include both start-ups and incubators, and it will be interesting to see how this affects the footprint and extension of the event. If you are interested in participating in BarnRaise 2015 or learning more about the event, please visit http://www.idbarnraise.com or get in touch with co-chairs Ellie Eberts and Jenni Schneiderman at barnraise@id.iit.edu. IIT Institute of Design is an EPIC2015 Sponsor. Roxanne Knapp is a graduate student at the IIT Institute of Design and the Marketing Lead for BarnRaise 2015. Previously she worked as a Program Associate at the Alliance for Peacebuilding where she helped strengthen organizations' and practitioners' capacity to learn from and respond to complex conflict environments. She is passionate about finding smart ways to engage with complexity and large-scale, systemic problems. Roxanne has a BA in International Relations from Brown University.